The message is clear to motorists – if you don’t tax your vehicle on time, DVLA will take action: tax it or lose it. The 11 areas of the UK have been targeted where vehicle tax evasion is highest (based on the number of enforcement actions that took place in 2018). The advertising campaign focuses on the consequences of not taxing your vehicle – from financial penalties to court action to clamping and finally the loss of a car. 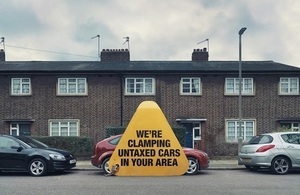 A giant clamp at the centre of the campaign image reflects the fact that DVLA take enforcement action against untaxed vehicles on streets across the country and it will happen to you if you don’t tax your vehicle on time. This campaign has a clear message for anyone who flouts the law in this way – tax it or lose it. It’s never been easier to tax your car, so there really is no excuse. We would rather not have to clamp or remove vehicles, but this campaign highlights the consequences of not taxing a vehicle. Having your vehicle clamped is expensive and inconvenient – and you could end up losing your car. Motorists can go online, 24 hours a day, to tax a vehicle or check whether their vehicle tax is up to date. You can even check by asking Amazon Alexa or Google Home – all you need is your vehicle registration.